These are some of the commercial fire hazards that you need to be aware of and keep contained so that an out of control fire doesn’t threaten your business. When you run any business that contains a kitchen, there are many of the same fire hazards as you would encounter in a home kitchen. These are some of the commercial fire hazards that you need to be aware of and keep contained so that an out of control fire doesn’t threaten your business. Fast food restaurants and even more sophisticated establishments need to have a clean and functional deep fryer. The grease and fat in the fryer can always splash out and come into contact with the cooking fire, which can create a dangerous situation if it does happen. That’s why you need to keep the fryer at least sixteen feet clear of any open flames. Alternatively, you can install a steel barrier that covers the fryers and prevents any potential fire hazards from this key part of your kitchen. Most commercial kitchens will use gas stoves and ranges as their main heating element. The cooking flame can easily set the ingredients on fire if they are left cooking too long, and the same flames can also burn sleeves and cooking tools, plus any towels used to wipe up spills and splashes. It’s easy to prevent fire hazards by exercising constant vigilance and making sure everyone upholds a culture of fire safety and common sense inside your kitchen. The griddle and grill are just as important, whether you serve an inexpensive brunch or expensive steaks made of the highest-quality beef. Don’t forget about the popularity of bacon at every meal. You’ll need to keep your grill and griddle as clean as possible to prevent grease fires. Grease vapors are just as much of a problem, so be sure to clean the hood, over both the range and the griddle. 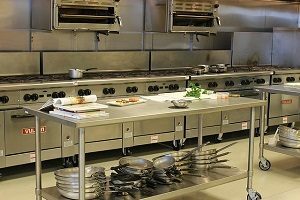 Regardless of what commercial kitchen you run, you can prevent most fire hazards by making sure your workspace is as clean as possible. Make sure that your employees are well-trained on what to do during busy rush periods that could cause the kitchen to be overwhelmed, with your servers and cooks pressured to turn out meals more quickly, which in turn can lead to disaster. What does this entail? Keeping every surface, pot, and pan clean, and having your fire suppression systems inspected regularly. This entry was posted on Friday, September 21st, 2018 at 9:12 am. Both comments and pings are currently closed.